Add a optin/optout checkbox at registration page or autosubscribe new users (double opt-in) to your MailChimp newsletter. Add a optin/optout checkbox at registration page or autosubscribe new users (double opt-in). Also it can bulk import existing users to your MailChimp newsletter. Requires Vanilla >= 2.0 (2.1 tested). Note that on Vanilla 2.0. * registration views will be overridden (but not overwritten) with internal views. 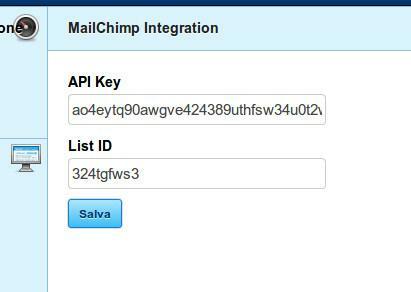 Insert in settings page your MailChimp APIKey and ListID and it works. Now you can bulk import all users from settings page. Try to register a new account to check mailing list subscription feature (based on plugin settings). You can generate an apikey in MailChimp "Account settings"->"Extras"->"API keys" page. It is an alpha-numeric string. You can find your list ID in MailChimp "Lists"->"Click on your list name"->"Settings"->"List name & defaults"->"List ID" page. Probably it is ten char string. Insert in settings page your MailChimp APIKey and ListID and...works. Does it work on a private community?